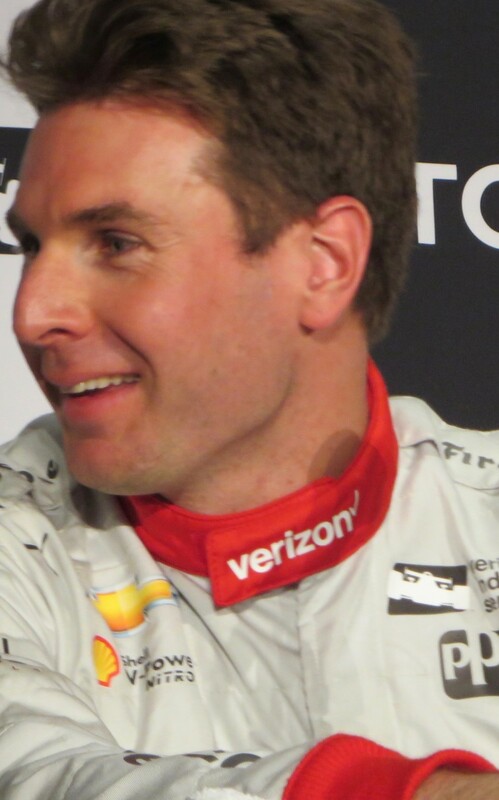 WILL POWER/No.12 Verizon Team Penske Chevrolet was fastest in the second practice session for the Verizon IndyCar Series Friday afternoon at the 42nd annual Toyota Grand Prix of Long Beach. His lap of 104.806 mph/107.5992 seconds was faster than the morning’s fastest time. 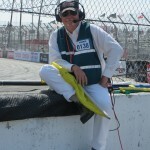 All 21 drivers were faster in the warm sunny Long Beach sunshine as the track heated up. James Hinchcliffe/No.5 Arrow Schmidt Peterson Motorsports Honda was second, and was so/stayed so once Power took over the running order from early leader, Juan Pablo Montoya/No.2 Verizon Team Penske Chevrolet. Hinch was quite proud of the fact that he beat Power to the post-practice press conference. Fist bump! 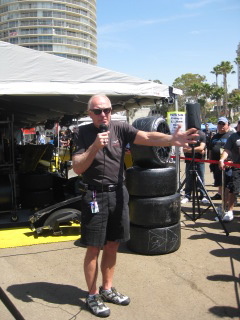 The Mayor of Hinchtown had nothing but praise for the Long Beach event. “It’s great. This event in general is so awesome. You don’t successfully pull something off for 42 years unless you’re doing something right. They do a lot right here. The circuit itself as far as street courses go is one of the most unique. You have some of the coolest corners in street course racing with the hairpin and the fountain. Third through fifth Graham Rahal/No.15 PennGrade Motor Oil Rahal Letterman Lanigan Racing Honda, Simon Pagenaud/No.22 PPG Automotive Refinish Team Penske Chevrolet, and early leader Juan Pablo Montoya/No.2 Verizon Team Penske Chevrolet – who was fastest overall in the morning session. Conor Daly was the fastest Rookie, driving No.18 Jonathan Byrd’s Hospitality Dale Coyne Racing Honda, in fifteenth place. He ran as high as fourteenth. 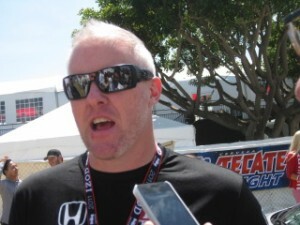 Daly, an American, is good friends with the other American Rookie, Alexander Rossi/No.98 Castrol Edge/Curb Andretti Herta Autosport with Curb-Agajanian Honda. 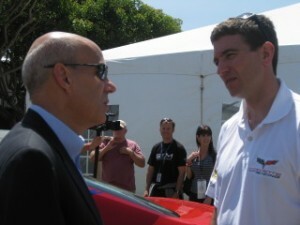 The two are bringing more awareness on young American drivers. IndyCar has a third practice session Saturday morning, followed by mid-afternoon qualifying for Sunday afternoon’s 80-lap race. 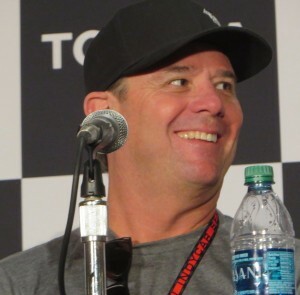 Before all the levity, Vasser said it was great to (again) be part of the Pro/Celebrity Race and see all the greatness done by the charity aspect of “this great event.” When asked, Vasser said he wouldn’t have qualified any differently had he known the grid was going to be inverted. MIKE CONWAY/No.27 Andretti Autosports started third Sunday and ended up winning his first ever open wheel race at the Toyota Grand Prix of Long Beach. He dropped back to nineteenth during his problematic first pit stop when he locked his brakes and slid past his pit stall. But, he said, with help from his crew he got back out and running to the top. Conway’s team had to tell him over the radio how to get to Victory Circle. 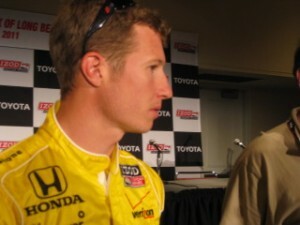 This year is Conway’s comeback, after his horrendous crash at last year’s Indianapolis 500. 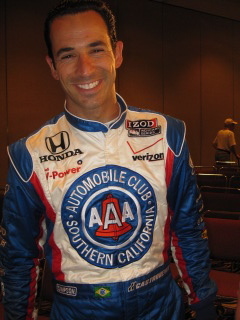 He has a full season’s ride with Andretti, and Long Beach was his 26th IndyCar start. 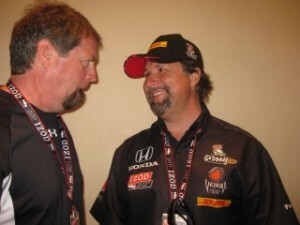 Team Owner, MICHAEL ANDRETTI, won at Long Beach last year with RYAN HUNTER-REAY/ No.28. Sunday RHR led once for four laps, but retired with transmission problems. Conway finished 6.3203 seconds ahead of runner-up RYAN BRISCOE/No.6 Team Penske, who gridded twelfth after being fastest in all the practice sessions. Conway turned the fastest leader lap of 100.163 mph/70.7328 seconds on Lap 83 of the 85-lap race. 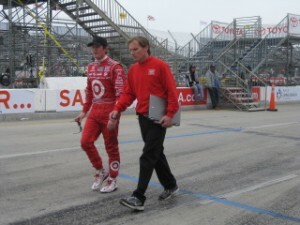 Third place went to points leader DARIO FRANCHITTI/No.10 Target Chip Ganassi Racing, who turned the fastest race lap of 100.266 mph/70.6597 seconds on Lap 84. 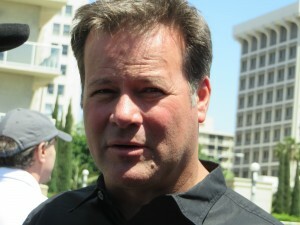 He has been on the podium for all three IndyCar races so far this season. Franchitti said he was impressed by the vibrancy of the LB crowd all weekend. It looked like there were a lot of people everywhere, he could hear them cheering, and it’s been a while since it’s been this good. 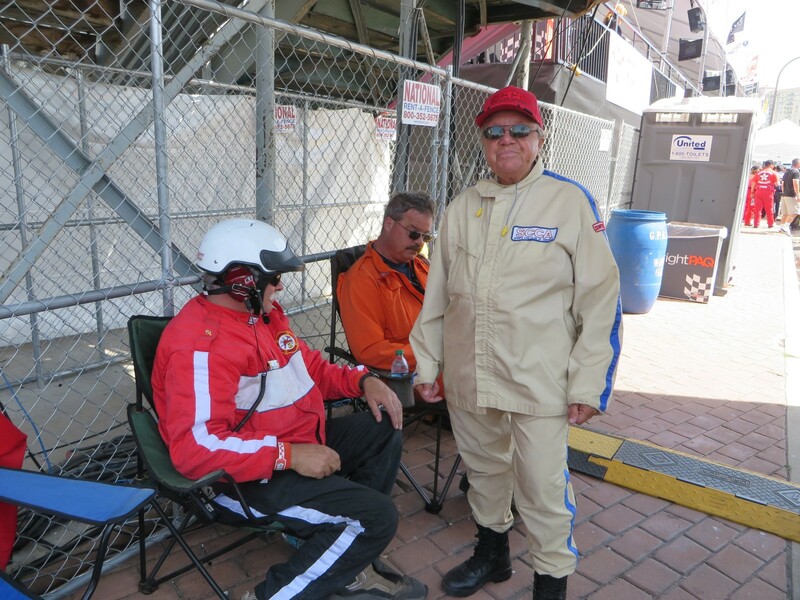 JIM MICHAELIAN, President of the Grand Prix Association of Long Beach, said while the actual crowd figures aren’t out yet, attendance was up all three days. He estimated 70,000+ for Sunday and 175,000+ for all three days. Hospitality was sold out, and Sunday morning, there were less than 200 seat tickets remaining. Sunday’s weather was mostly grey and cool – temperatures in the mid sixties. The sun made a feeble attempt to shine, but……. Fourth and fifth finishers were Rookie JAMES HINCHCLIFFE/No.06 Newman/Haas Racing and ALEX TAGLIANI/No.77 Sam Schmidt Motorsports. Hinchliffe was the top Rookie, and he turned the second fastest race lap, on Lap 82. This was is second IndyCar race. 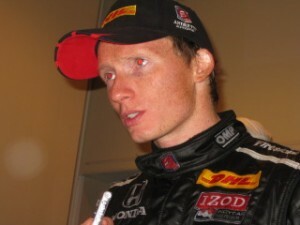 Last year he won the Long Beach Firestone Indy Lights race from the pole position. He raced Lights in 2009 and 2010. Prior to that, he ran for three years in the Atlantic Series. J.R. HILDEBRAND/No.4 Panther Racing finished seventeenth after starting last, but is leading the Sunoco Rookie of the Year standings. DANICA PATRICK/No.7 Andretti Autosports was the top female driver, starting twentieth and finishing seventh behind ORIOL SERVIA/No.2 KV Racing Technology. Patrick gained the most race laps from the start – 13. There were seven lead changes among six drivers. Briscoe led twice for the most laps – 35. 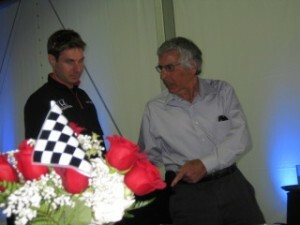 Polesitter WILL POWER/No.11 Verizon Team Penske led twice for 29 and winner Conway led for fourteen laps. Other leaders were Tagliani for four laps; Conway’s teammate, RHR-two laps; and SCOTT DIXON/No.9 Target Chip Ganassi Racing – one. Sixth through tenth in points: Tagliani – 73; Dixon & Briscoe & SIMONA De SILVESTRO/No.83 Nuclear Clean Air Energy HVM Motorsports – all with 66; and VITOR MEIRA/No.14 ABC Supply/AL Foyt Racing – 64. 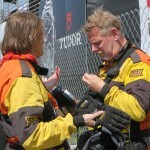 The next race is 1 May 2011 in Brazil. 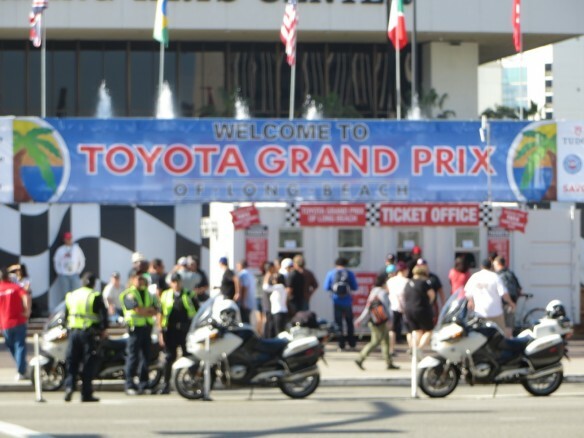 Sunday morning at the Toyota Grand Prix of Long Beach was the first day in the past four which didn’t start with warm sunshine. The skies were leaded with fog and while the weather claimed to be in the low sixties, it seemed cooler. The Firestone Indy Lights had their fifteen minute warm up called practice, with Polesitter ESTEBAN GUERRIERI/No.7 Sam Schmidt Motorsports on top, where he’s been all weekend. All 17 entries have been on course for all sessions. Izod IndyCars had half an hour of uneventful morning practice, with WILL POWER/No.12 Verizon Team Penske on top, followed by JUSTIN WILSON/No.22 Dreyer & Reinbold; ALEX TAGLIANI/No.77 Sam Schmidt Motorsports; HELIO CASTRONEVES/No.3 Team Penske; SIMONA De SILVESTRO/No.78 Nuclear Clean Air Energy HVM Racing; MIKE CONWAY/No.28 Andretti Autosport; DARIO FRANCHITTI/No.10 and SCOTT DIXON/No.9 Target Chip Ganassi Racing; TONY KANAAN/No. KV Technology – Lotus; and JAMES HINCHCLIFFE/No.06 Newman/Haas Racing. Now that IndyCar practice is over, the starting race tire designation information has been provided. Of the 27 drivers running the two-hour Sunday afternoon race, seven are starting with Primary (harder) Firestone tires, with the remaining twenty starting on the softer Alternative tires, marked with a large red stripe on the outside. This allows fans and others to know which tire the car is running. The stripe is bigger and easier to see than the stripes run on the Formula One Pirelli tires. The top eleven starters all opted for Alternative tires. The seven drivers starting on Primary tires are RYAN BRISCOE/No.6 Team Penske starting twelfth; MARCO ANDRETTI/No.26 Andretti Autosport-P14; RAFAEL MATOS/No.17 AFS Racing-P19; DANICA PATRICK/No.7 Andretti Autosport-P20; TAKUMA SATO/No.5 KV Racing Technology – Lotus-P22; PAUL TRACY/No.8 Dragon Racing-P25; and ANA BEATRIZ/No.24 Dreyer & Reinbold Racing-P26. 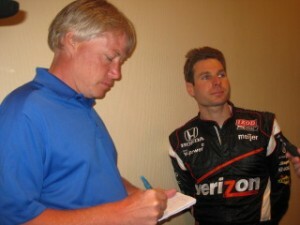 Tracy is running all the “bigger events” on the 2011 Izod IndyCar schedule and now he’s filling in the blanks with other races. His goal is get a full time ride for next year, which will be his Farewell Tour. 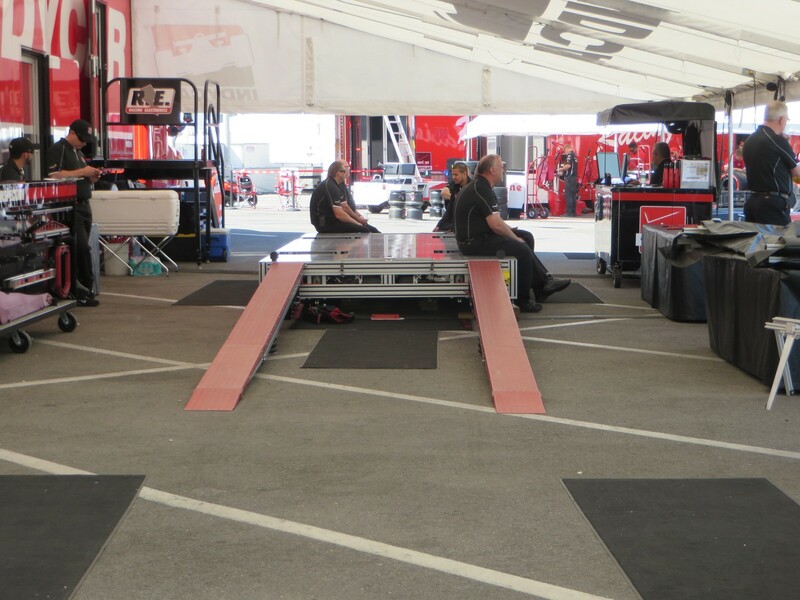 Hinchliffe had a scare Friday when his car caught fire during the first IndyCar practice, so he pulled into the back door of the Pit Lane at Turn Ten with two foot flames and smoke from the rear. Hinch’s rear cowling was melted near the shaft and the gear box was locked. 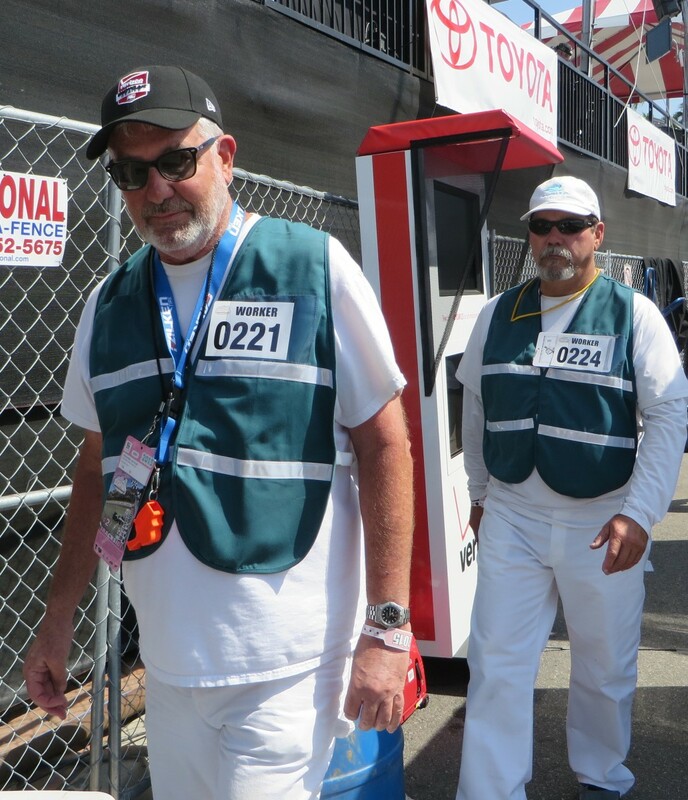 PAUL EINHORN, volunteer race marshal from San Francisco Region SCCA, was stationed at that point and held up a fire extinguisher bottle. Hinch pulled up and bailed out of the car. Einhorn went over the wall putting out most of the fire before the pit fire response people arrived. 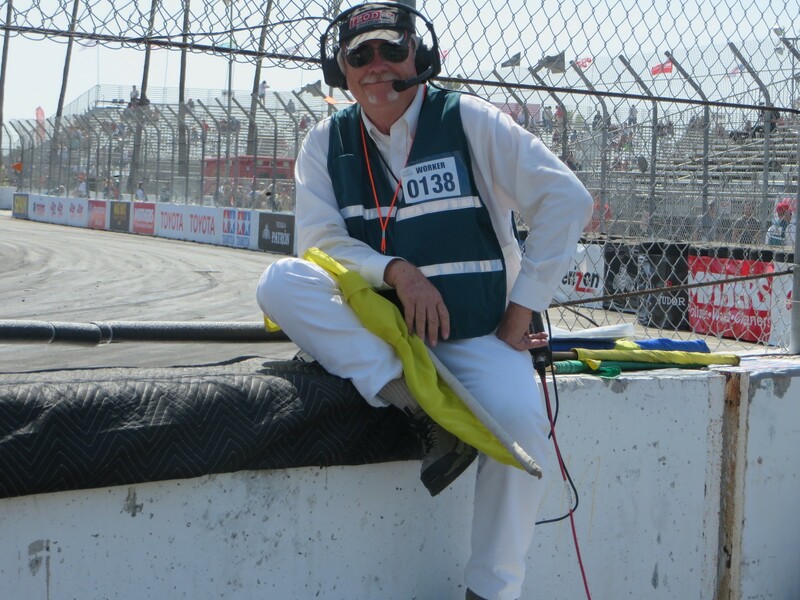 JIM SWINTAL, the IndyCar dispatcher on the landline to the turns, said Paul did a very professional job. 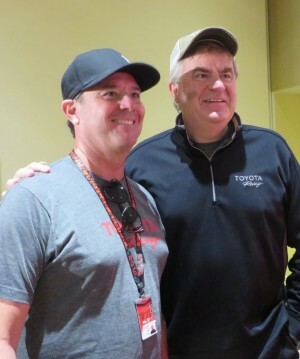 Saturday morning, IndyCar officials came unannounced to the morning Flag & Communications meeting to thank Paul in front of the entire corner workers crew and presented Einhorn with an official IndyCar hat. There’s no new plays on words to be used for WILL POWER who again has the pole position for the Izod IndyCar race Sunday at the Toyota Grand Prix of Long Beach, in 86 degreesF heat. 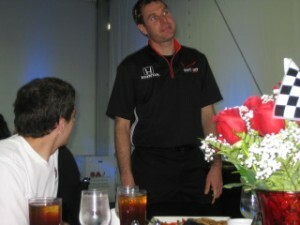 The Aussie driver in No.3 for Team Penske scored his third straight pole in the first three races of the 2011 IndyCar season. 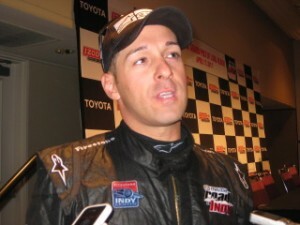 It was his third straight pole at Long Beach and his nineteenth career pole position. RYAN HUNTER-REAY/No.28 Andretti Autosport had led for some time, and it was a duel between the two, which RHR lost – by mere nano-seconds. His lap was 1:09.1409/102.469 mph. Deja vu. RHR and Powell went at it last year, with Hunter-Reay prevailing for the victory…after starting second. 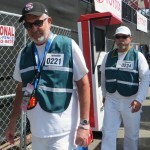 The ambient temperature was 86 degreesF, with the track heating up to 118 degreesF. The Fast Six in Qualifying were Powell, RHR, MIKE CONWAY/No.27 Andretti Autosport, ORIOL SERVIA/No.2 Newman/Haas Racing, JUSTIN WILSON/No.22 Dreyer & Reinbold Racing, and HELIO CASTRONEVES/No.3 Team Penske. 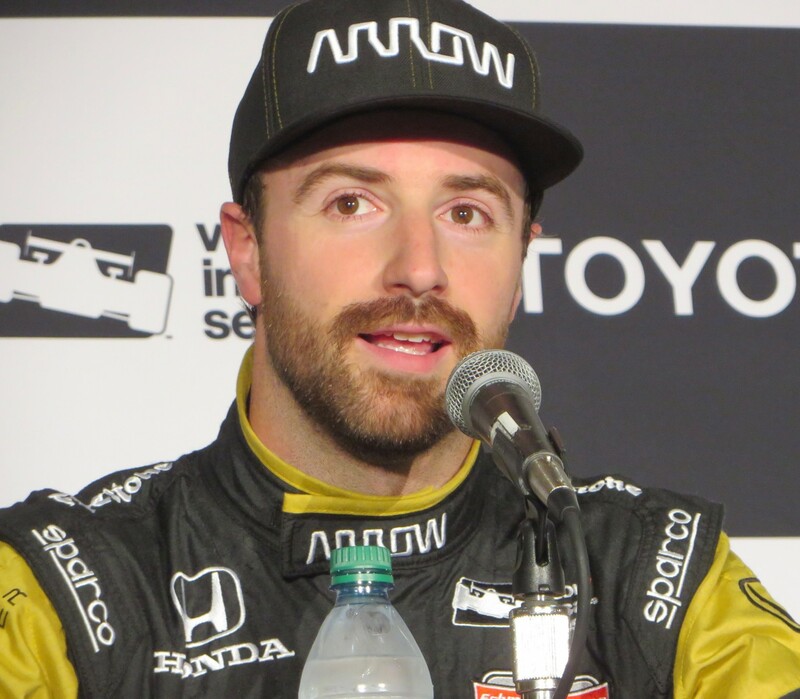 The top Rookie of six was JAMES HINCHCLIFFE/No.06 Newman/Haas Racing, qualifying eleventh. Rookie J.R. HILDEBRAND/No.4 Panther Racing lost his best laps as a penalty assessed by IndyCar, for “impeding the process of GRAHAM RAHAL/No.38 Service Central Chip Ganassi Racing” – moving over on him when Rahal was exiting the pits. Rahal starts sixteenth. Hildebrand starts last. The top female was SIMONA De SILVESTRO/No.78 Nuclear Clear Air Energy HVM Racing in eighteenth position. RYAN BRISCOE/No.6 Team Penske and Power were first and second in the Saturday morning practice, followed by SCOTT DIXON/No.9 and DARIO FRANCHITTI/No.10, both driving for Target Chip Ganassi Racing. Fifth was RHR. 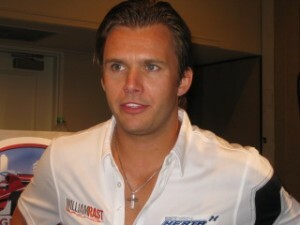 DAN WHELDON, who used to drive for Panther Racing, will be racing the Indianapolis 500 this year with Bryan Herta Autosport. Saturday Herta and Wheldon held a press conference to announce that MIKE CURB and CARY AGAJANIAN will be partnering with the team. 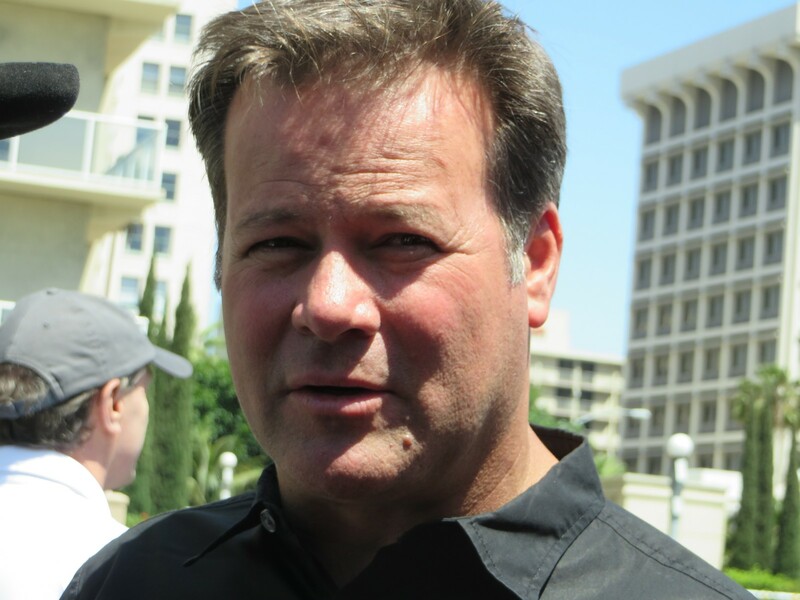 Agajanian had two requests – that the car run No.98 – as it will and now for that race, it will be called Bryan Herta Autosport/Curb-Agajanian. 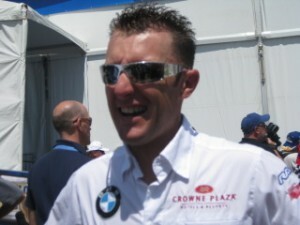 BHA is a partnership of Herta and race engineer STEVE NEWEY. The other request is that a show car be displayed in the Ronald Reagan Presidential Library in Simi Valley, as part of its Centennial Celebration. That car will be joined by 11 other cars, for an exhibit opening 27 May and lasting through 23 October 2011. President Reagan was a big race fan and started his radio career announcing at a dirt track in Des Moines, Iowa. Also part of the exhibit will be Reagan’s Air Force One plane. Sunday’s IndyCar race is aired live on Versus starting at 1:30 pm local time. The Left Coast Weatherman must be a race fan. 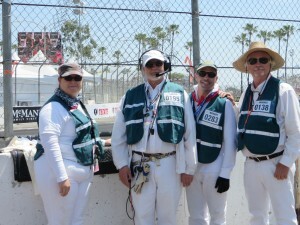 The weather continues to be gorgeous at the 37th annual Toyota Grand Prix of Long Beach. Saturday the temperatures rose quickly, so that by the time the Firestone Indy Lights were on track for mid-morning practice, it was 82 degrees F.
Fourteen of the 17 drivers are Rookies. However, in the words of Indy Lights officials as well as others, the talent pool runs deeper than in a long time. There are several really hungry young lions looking to move up the IndyCar Ladder to Success, and maybe beyond. That’s not to say there haven’t been some on-track problems. While no red flags, there were seven yellow flag situations for single-car crashes into tire and concrete walls.No drivers were injured. ESTEBAN GUERRIERI of Argentina has been the fastest driver in all three sessions, including qualifying. Guerrieri, one of three Sam Schmidt Motorsports driver, broke the driveshaft on his car during the first lap Friday. So he jumped into the empty car of his teammate, CONOR DALY and was fastest without any fitting changes to the car. This allowed Rookie Guerrieri to learn the track and also shake down Daly’s car. Meanwhile, Daly was still making his way back to California from Barcelona where he was testing GP3. Flight delays between Spain, Paris and US made him miss Friday’s one and only Lights session. 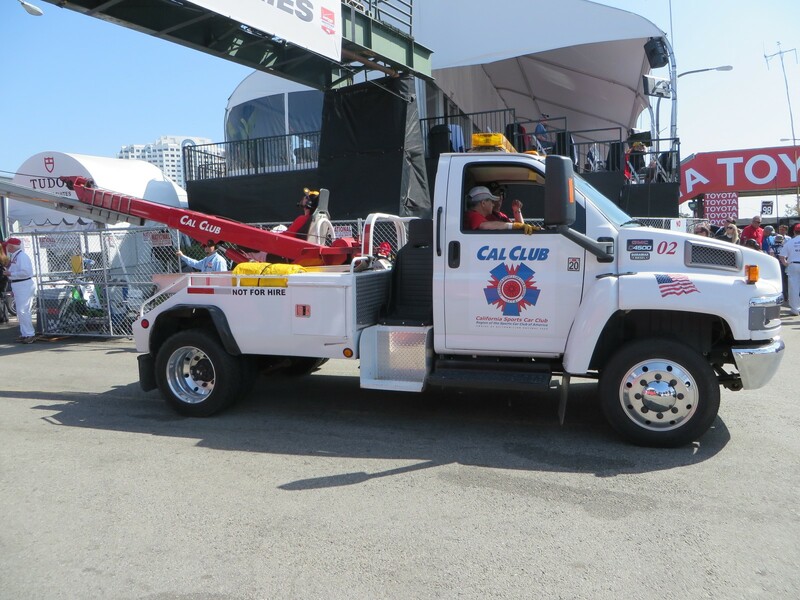 Daly ordinarily would have had to skip the entire LBGP weekend, but he would have none of that. 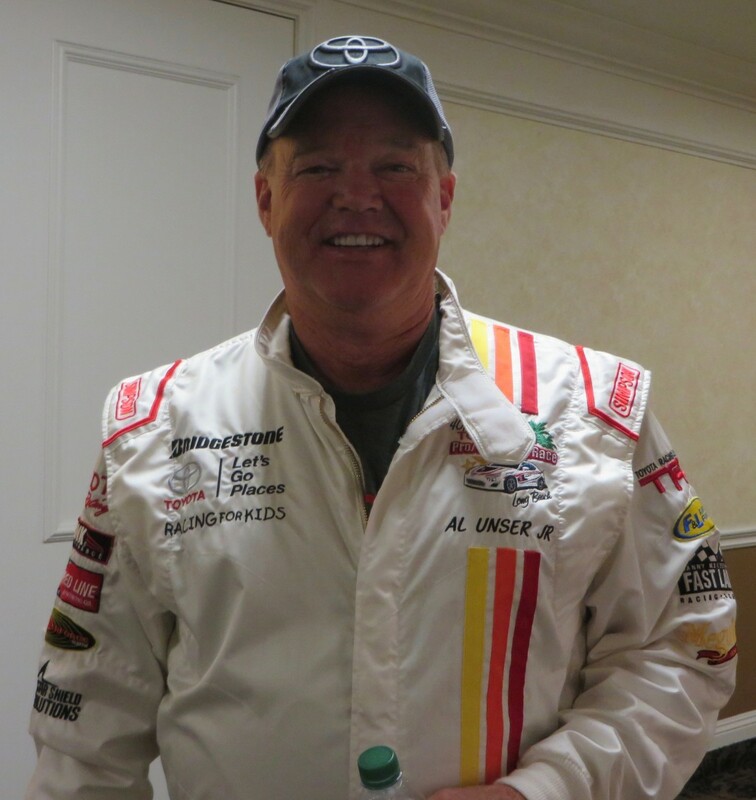 “Long Beach is such a mega event that even if the gamble did not pay off, and I had to miss the first session, I still wanted to be part of the weekend.” Daly is his own logistician, making all travel arrangements and flight plans, all on commercial aircraft – no private charters. 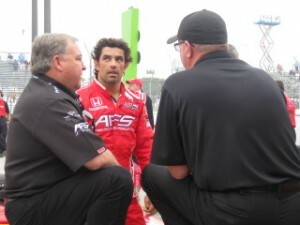 Daly spent time with his crew and engineer, CHRIS FINCH, Friday afternoon, and quickly got up to speed. 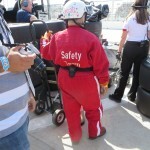 He was seventh in Saturday morning practice, and overall for the sessions. He ran as high as second in qualifying before finishing fourth behind two of his teammates. Guerrieri’s pole lap in No.7 was 1:13.6957/96.126 mph, a new qualifying track record. It was his second pole of the season, the first being at St. Petersburg, and he’s been on the front row for all three races this year. Second was PETER DEMPSEY/No.36 02 Racing Technology; followed by JOSEF NEWGARDEN/No.11; Daly/No.77; and ANDERS KROHN/No.9 Belardi Auto Racing. All are Rookies. The top/only non-Rookies were STEFAN WILSON/No.5 Andretti Autosport, and GUSTAVO YACAMAN/No.2 Team Moore Racing, gridding sixth and seventh, respectively. Rounding out the top ten are VICTOR GARCIA/No.22Team Moore racing; JUAN PABLO GARCIA/No.12 Jensen MotorSport; and JAMES WINSLOW/No.26 Andretti Autosport. Four of the drivers are from the United States, two from Canada and one from Mexico City, making seven for North America. England has two drivers. Other countries represented with one driver each are: Angola; Argentina; Brazil; Colombia; Ireland; Norway; Spain; and Venezuela. All seventeen are males. One recent female Lights alumni is now running IndyCars – ANA BEATRIZ of Brazil. She had two poles and two victories in her two years of Lights. She moved up to selected IndyCar races last year and is running the full IndyCar season this year. Second-year IndyCar racer, SIMONA De SILVESTRO of Switzerland came from the now defunct Atlantic Series, which was a rival series to the Lights Series. Sunday’s Firestone Indy Lights Series hour-long race will start at 11:05 local time. Team Penske drivers RYAN BRISCOE and WILL POWER were the fastest overall Izod IndyCar drivers Friday in the two practice sessions at the Toyota Grand Prix of Long Beach. There were two sessions, morning and afternoon. Power/No.3 Team Penske was quickest in the morning at 1:11.403/99.213 mph, and Briscoe/No.6 going faster in the afternoon – 1:10.7403/100.152 mph. 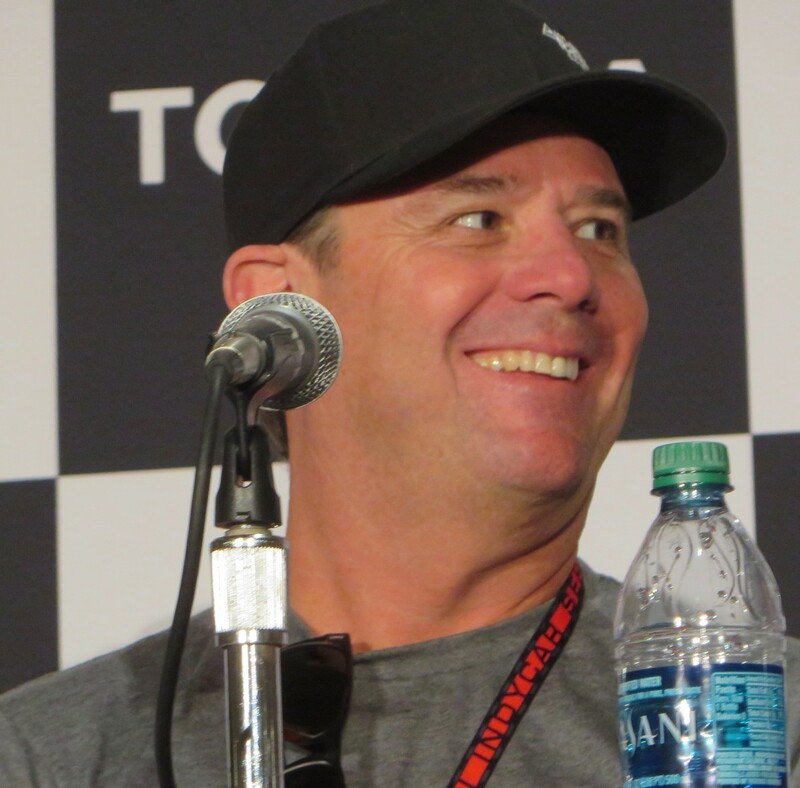 Under the newly instituted IndyCar rules, Briscoe selects which Qualifying group he runs on Saturday – he chose Group Two. 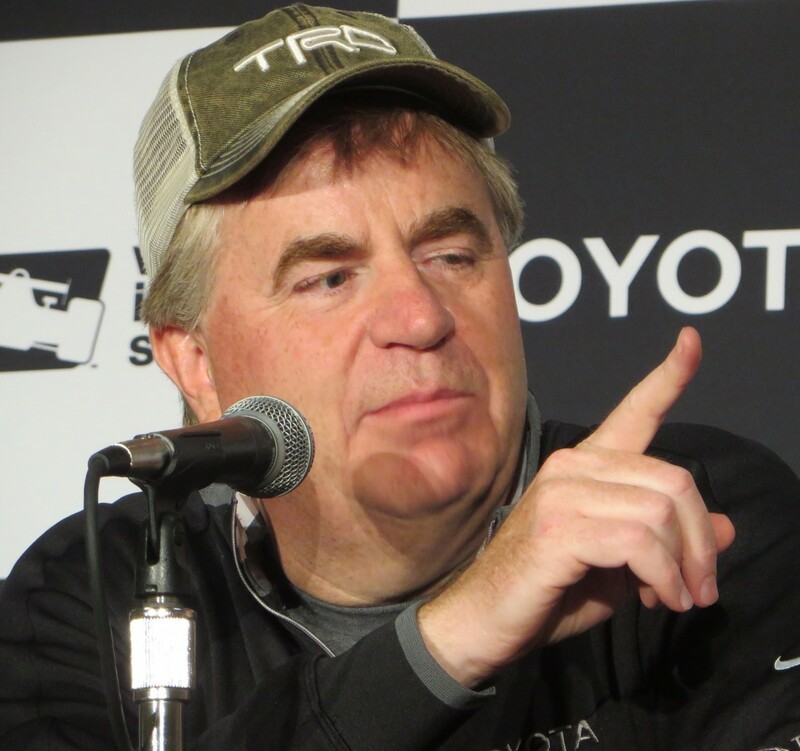 Briscoe said that among those who had requested IndyCar to change the Qualifying process were his team owners, ROGER PENSKE, and CHIP GANASSI of his eponymous team, as well as most drivers in the new IndyCar Drivers Association which discussed the topic early on this year. Some of the other series use a variety of tires, and so far this weekend, Briscoe said, the track is taking all the rubber. He said that by Sunday morning it would be noticeable to the IndyCar drivers that the ALMS race ran Saturday afternoon – a series which has open tires. Three tire manufacturers are represented among the five class pole winners. Power will be in Group One, and said the disadvantage was the the track is a little dirtier in the first group. The top five in Practice One were Power, RYAN HUNTER-REAY/No.28 Andretti Autosport, SCOTT DIXON/No.9 Target Chip Ganassi Racing, JUSTIN WILSON/No.22 Dreyer & Reinbold Racing, and Briscoe. The top five in Practice Two were Briscoe, Power, Hunter-Ray Dixon and ALEX TAGLIANI/No.77 Sam Schmidt Motorsports. Group One will have 13 drivers including two Rookies, and Group Two has 14 with four Rookies. Both top Rookies are in Group Two. CHARLIE KIMBALL/No.83 Novo Nordisk Chip Ganassi Racing was the top Rookie in the first run in P19, and JAMES HINCHCLIFFE/No.06 Newman/Haas Racing was fastest in the second session in P13. Hinch recovered nicely from his fire in the first session. By the time he got off track at an emergency station, there was a lot of car damage. But his crew beavered away and got him out for the afternoon session, with better results. 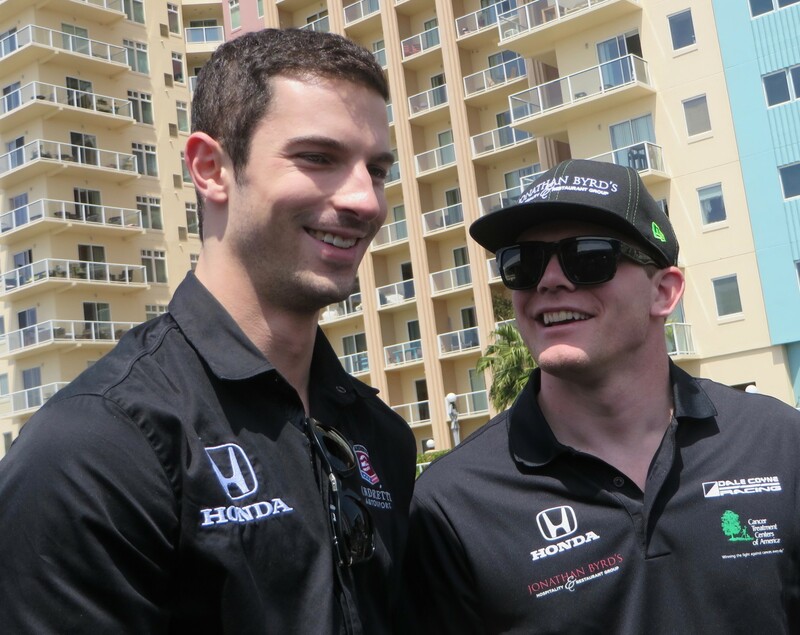 IndyCar continues to have a wide international driver representation in its ranks. There are 13 countries represented, including the United States which has six drivers. Canada has three, to make eight for North America. The other countries are Australia-2; Brazil-5; England-3; with Colombia, France, Japan, New Zealand, Scotland, Switzerland and Venezuela all having one each. All three of the female drivers are from different countries: ANA BEATRIZ/No.24 Dreyer & Reinbold – Brazil; SIMONA De SILVESTRO/No. 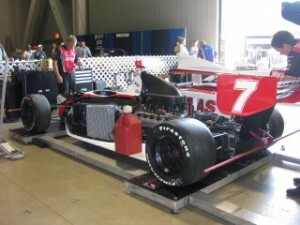 78 Nuclear Clean Air Energy HVM Racing – Switzerland; and DANICA PATRICK/No.7 Andretti Autosport – US. IndyCar has an hour practice session Saturday morning, with eighty minutes for Qualifying Saturday mid-afternoon, probably the warmest time of the day. Friday’s temperature reached the low eighties, and the breeze helped. It’s Friday – Day One – of the 37th Toyota Grand Prix of Long Beach, and the weather is beautiful with clear blue skies and a nice breeze to temper the heat. The good news is that the fan-friendly paddock (road racing name for garage area) is absolutely clogged. The bad news is that it’s absolutely clogged. People everywhere. 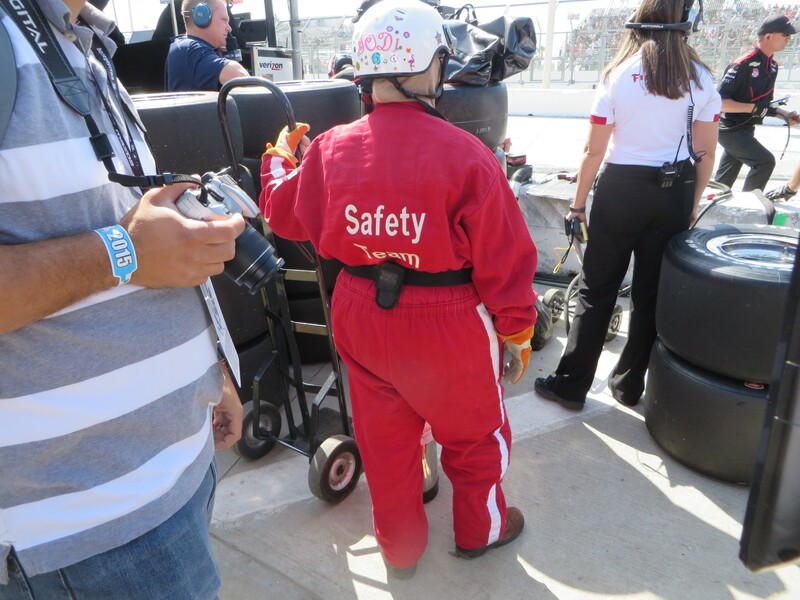 Pit tours are flourishing, and spectators are everywhere enjoying the ambience. After a while I longed for Maserati air horn to clear a path. It’s a good problem to have. The American Le Mans Series was first out Friday morning, for a two-hour practice, starting at 7:15 am = oh dark thirty. There second/only other session Friday is Qualifying at 5:00 pm local time, for ninety minutes. Thirty-one cars are in the field, spread among five classes, and all were on course during the session. By far, the largest category is hotly contested GT with 14 entries. In the five years ALMS has been coming to Long Beach, this is the largest field. 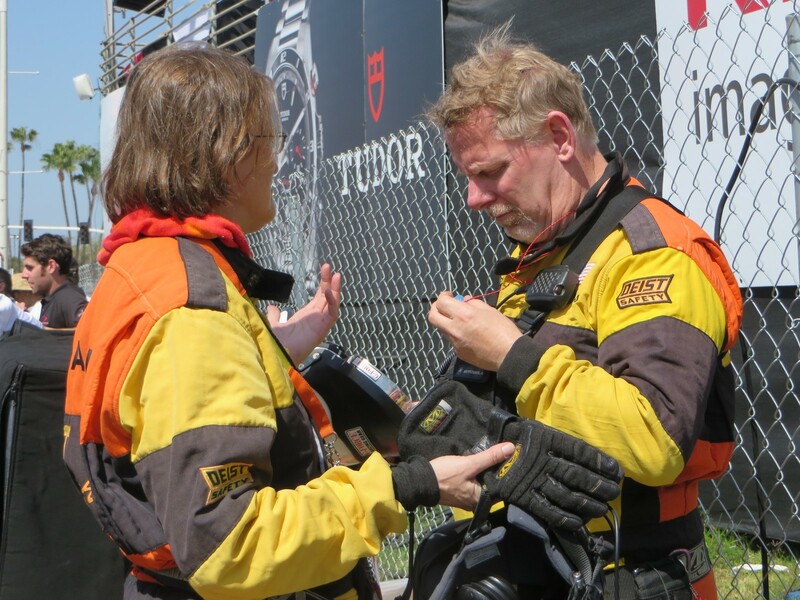 So far, there has only been one team getting back to back class victories – PATRICK LONG and JORG BERGMEISTER/No.45 Flying Lizards Porsche 911 won the GT class the last two years and are looking for a triple. And Long is on his way, turning the fastest GT lap in Friday’s morning’s Practice – eighth overall. Long, ever the over-achiever, is also running in the Pirelli World Challenge Championships race this weekend, in No.45 TruSpeed Porsche 911 GT3. So far he’s the only driver I’ve spotted in more than one race. Another double winner was the Corvette Racing team with OLIVER BERETTA and OLIVER GAVIN who won GT1 in 2007 and 2009. This year the two Oli’s are in separate Corvettes, with new co-drivers – TOM MILNER with Beretta, and JAN MAGNUSSEN with Gavin. There were two Red Flag situations, the first caused by Beretta hitting the tires in Turn Eight. He was OK, but the car sustained heavy front end damage. He continued to the pits, while the track shut down to repair the tire wall. WOLF HENZLER/No.17 Porsche 91 Team Falken Tire Porsche 911 GT hit the tires in Turn Nine. He was OK, but his car’s rear end took the brunt of it. Henzler made it back to the pits, while crews repaired the tire wall. 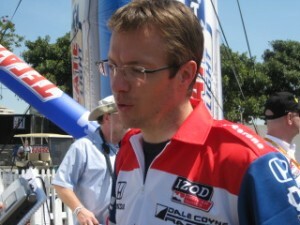 Henzler’s co-driver is BRYAN SELLERS. They ended up fifteenth overall, seventh in GT class. 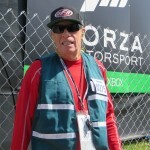 Overall Friday morning GUY SMITH drove No.16 Dyson Racing LMP1 Lola Mazda to the top spot. His teammate is CHRIS DYSON. The next fastest class was LMPC and GUNNAR JEANNETTE/No.06 CORE autosport Oreca, who is paired with RICARDO GONZALES was fastest, third overall. 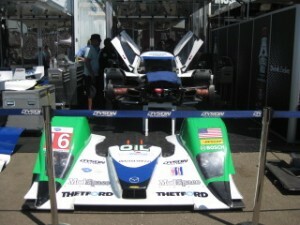 The LMP2 class has two entries, both from Level 5 Motorsports. CHRISTOPHE BOUCHUT was fastest in No.33 Lola Honda, seventh overall. Team owner SCOTT TUCKER is Bouchet’s co-driver. JEROEN BLEEKEMOLEN took top honors in the GTC class in No.54 Black Swan Racing Porsche 911, twenty-fourth overall. Bleekemolen shares driving with TIM PAPPAS. Oliver Gavin is an avid marathon runner and is missing this weekend’s London Marathon, with his BRDC team – British Racing Driver’s Club. Gavin’s ALMS race is Saturday afternoon. Sunday morning – 6:30 am – he is running a special marathon course he devised, which includes the coastal beach area. He will run it three times for a total of 26 miles. Gavin’s good buddy, Guy Smith, will run the last eight miles with Oli. After being fastest Friday he should be fit and in a good mood for the run, which raises money for Cystic Fibrosis. It was a beautiful sunny beach kind of day in Long Beach Thursday, the day before the big three-day grand-daddy of all street races begins. There was activity in and all around the 1.97-mile, 11-turn street circuit. 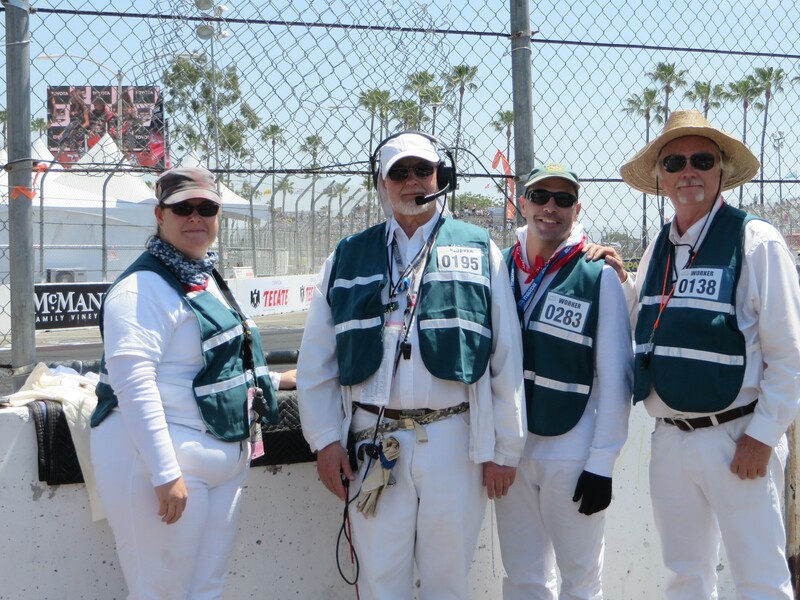 This is the 37th running of the Grand Prix of Long Beach, long known as the Toyota Grand Prix of Long Beach. There’s not many other US races with that kind of continuity. 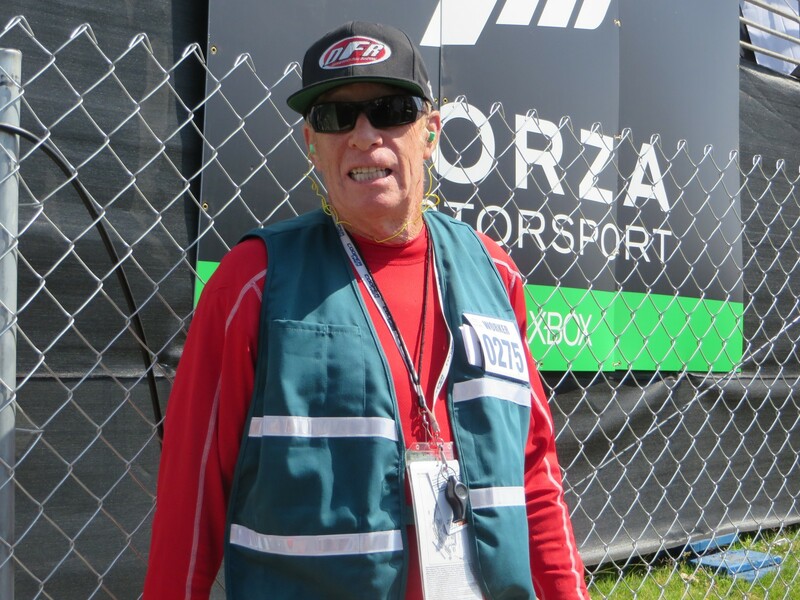 One man who has been around for all 37 years is JIM MICHAELIAN, the President of the Grand Prix of Long Beach Association. 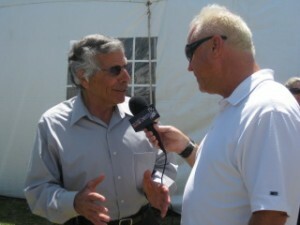 He hosted a large media contingent Thursday inside the track by the Lagoon. Drivers from all of the race series this weekend were present. 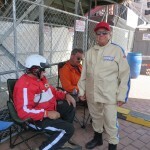 Outside the Tecate Light Lounge, it was an al fresco, open air bull pen – free for all with the media and drivers mingling.